New research has shed light on one of Australia's most enigmatic birds, the banded stilt. This pigeon-sized shorebird has long been a source of intrigue due to its bizarre and extreme breeding behaviour. They fly hundreds or thousands of kilometres from coastal wetlands to lay eggs that are 50-80% of their body mass in normally dry inland desert salt lakes, such as Lake Eyre, on the rare occasions they are inundated by flooding rain. 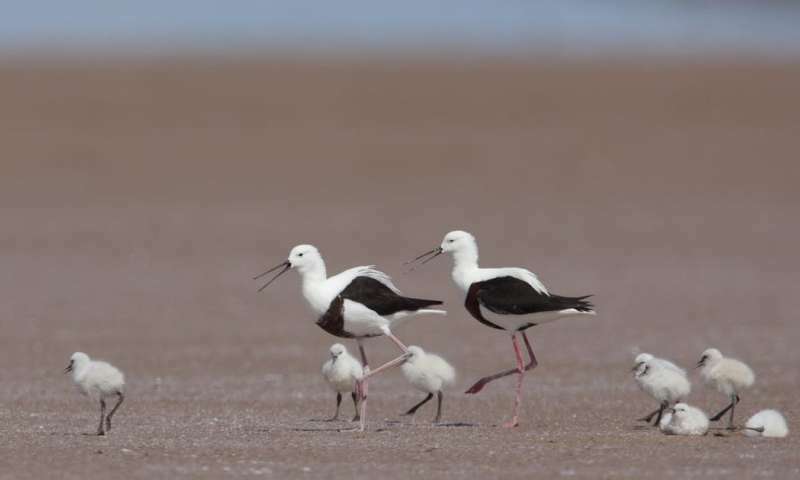 To investigate this behaviour, and to assess the stilts' conservation status, we began a study in 2011, during which I was based in outback South Australia, ready to jump into a small plane after every large desert rainfall. We also satellite-tagged nearly 60 banded stilts, using miniature solar powered devices around half the size of a matchbox. Brine shrimp eggs lie dormant in the lakes' dry salt crust for years or decades between floods, but upon wetting they hatch in their billions, creating a "brine shrimp soup" – a rich but short-lived banquet for the nesting stilts. These models showed that conditions have been suitable for breeding more than twice as often as breeding events have actually been recorded. It seems that stilts' nesting behaviour is so remote and hard to predict that scientists have been missing half the times it has happened. Salt lakes in northwestern Australia are vital for banded stilts' breeding. Our satellite tracking showed that birds from across the continent can reach these lakes after rain. Satellite images also suggested these lakes fill with water much more frequently than southern breeding sites. This action will create permanent brine pools in some parts of the lake, and prevent other areas from receiving any water. As surface water drains into evaporation ponds, it's likely the first rains after a long dry spell will no longer prompt mass brine shrimp hatching. Without this brine shrimp "soup", banded stilts cannot breed at the site. If both the stilts' inland breeding and coastal refuges are under threat, how can they survive?